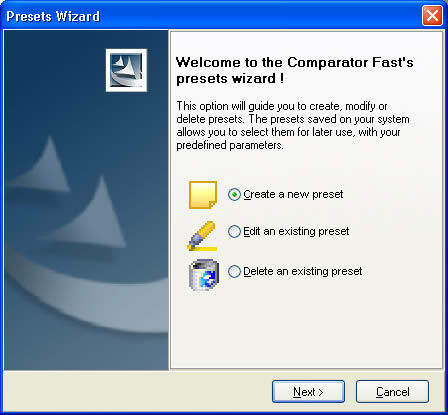 Presets Wizard will guide you, step by step, in the easy process of create / modify / delete a predefined preset. A preset saves your time... all the settings you specify can be easily used later. You should follow the guides of each step, until the wizard finished. Choose the options of each step, click the Next button when you finish each step. If you need to go to previous page, if exists, you may click the Back button. You may cancel at any time clicking the Cancel button or closing the Wizard's window. Before any changes, you'll see a "Preview" window, with a detailed description of the preset settings and the task (New, Edit or Delete preset). If you click Next on this preview window, the changes will be processed according as selected task (Create a new preset, Edit an existing preset or Delete an existing preset). If you don't want to perform what the preview's window is showing, click Cancel to close the Wizard's window or click the Back button until you get the options you want to modify. Here you may click on Finish if you finished to work with the Wizard, or click Start if you want to start over a new Wizard's process.